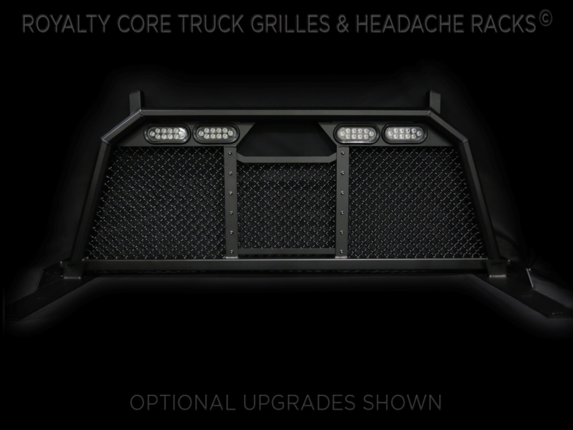 With double frame construction made of advanced corrosion-resistant T6 billet aluminum and TIG welded reinforced mesh, this Royalty Core headache rack offers maximum protection against all types of cargo in the truck bed. Designed to fit 2011-2016 F-250 and F-350 trucks exactly, this headache rack can be installed within minutes. Along with this headache rack, you'll also get all the stainless steel mounting hardware and installation instructions you need for a smooth installation. This headache rack is protected by Royalty Core's lifetime structural integrity warranty, as well as a one-year finish warranty. Designed to match the silhouette of your 2011-2016 Ford Super Duty cab, this headache rack offers equal parts style and function. It sports a stylish appearance that keeps your truck looking great while hauling cargo. With this headache rack on your truck, you'll enjoy a wide variety of features that make it the toughest headache rack on the market. Installing this headache rack is quick and easy, and it can be removed in a matter of minutes. This headache rack is made in the USA and it's covered by a lifetime warranty. As an F-150 owner, you would be hard-pressed to find a better headache rack for your truck elsewhere. Get yours!